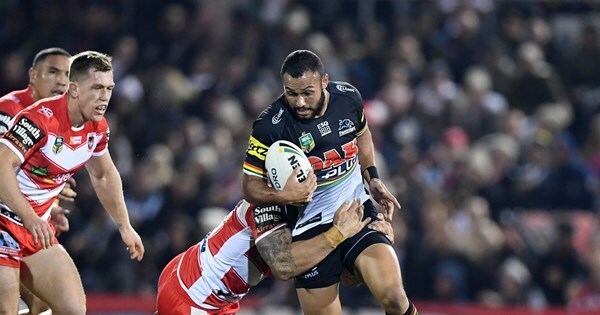 Penrith Panthers winger Tyrone Phillips has been charged with mid-range drink driving, the club confirmed on Sunday. The spiral begins, I hope he changes his mindset for his own sake. and parked in club foyer. Hmmmm, unfortunately Puss these players don’t have the nous to deal with issue on issue. Tyrone Phillips has resigned from the Panthers effective immediately. Do we still have to give him cuddles and make sure he is ok? Only if you feel it’s necessary Kev. OK, I know footy players are supposed to be role models and a line needs to be drawn in the sand. However I remain to be convinced that drink driving is so heinous a crime that players are punished twice; once by the courts and again by their employer (I know Phillips “resigned” but I wonder if this is strictly true). Take this to it’s logical extreme and drink driving would be a fireable offence for anybody, regardless of their occupation. Surely the vast majority of employments would not be affected by a drink driving charge; some examples -shop assistants, factory floor workers, office workers, need I go on. The second point is that it could be perceived by many (certainly me) that the double punishment is overkill - and I know that part of the players agreement requires them to be “spotless”. Certain behaviour is obviously totally unacceptable but personally I think the courts should handle drink driving. Just to be clear the drink driving offence wasn’t the only thing that Tyrone Phillips was in trouble for. He also was allegedly involved in one of the “Pre-Season Tapes” as well. I think this plus the drink driving issue lead to his eventual resignation to the club. Steve, I was being sarcastic BTW, I’m sure you knew that. Although I agree with AR if it was a first offence or out of the public domain (I doubt I would get the flick if the same issue arose, won’t happen to smart) I also agree that when you have a ‘public’ persona, there are different standards expected. The fact he has been involved in 2 incidents, 1 a disregard for human compassion (unknowingly being involved in videoing someone while being the “centrepiece” speaks volumes) the second a disregard for the public and the law says to me this boy needs to take some time out. I hope it doesn’t ruin him personally but sometimes reality checks are the greatest lesson in life. Just my 2 bobs, good luck to him but happy to have him out of our family. I know mate. But you’ll get the occasional person coming through here and not understand the context.